The surgical treatment of obesity is not without its negative side. Nutritional deficiency is one of the complications that often follow weight loss surgery. Those who underwent malabsorptive procedures such as gastric bypass and duodenal switch are at higher risk of nutritional deficiency. Vitamin B12 is a major vitamin that is commonly affected. Vitamin B12 which is also known as cobalamin is a water-soluble vitamin that is often prescribed along with other supplements (calcium, vitamin D, and iron) after bariatric surgery to prevent deficiency. Vitamin B12 can be gotten from different natural food sources. Animal sources include milk, egg, meat, and fish. There are no natural plant sources of vitamin B12 however some cereals are adequately fortified. The absorption of vitamin B12 occurs in the distal part of the small intestine (distal ileum). Although the lining (mucosa) of the mouth is capable of absorbing vitaminB12 from these natural sources, this is small and of little significance. The stomach secretes a substance known as an intrinsic factor which binds to vitamin B12. In the absence of intrinsic factor, the absorption of vitamin B12 in the small intestine becomes impossible. 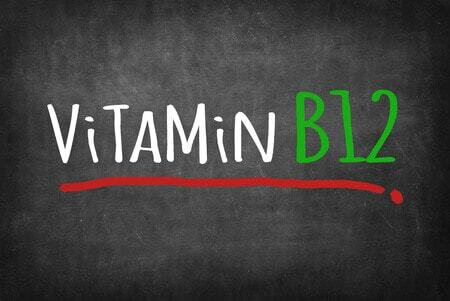 Numerous enzymatic, chemical reactions in the body require vitamin B12 as a cofactor. Cell division also needs vitamin B12. This will be more obvious in the rapidly dividing cells in the body such as the blood cells and the cells lining the gut. The production of red blood cells in the body will be defective in the absence of vitamin B12, and a condition known as megaloblastic anemia will result. Vitamin B12 also plays a significant role in proper functioning of the nervous system. Why does deficiency of vitamin B12 occur after bariatric surgery? Weight loss surgeries either reduce the size of the stomach or lessen the absorption of nutrients or both. The reduction in stomach size results in a decrease in ghrelin (hunger hormone secreted by the stomach lining) and reduced food intake. There is also a reduction in the production of an intrinsic factor that is necessary for vitamin B12 absorption. For example, in gastric sleeve surgery, the stomach is resected, and the production of an essential factor is reduced. In gastric bypass surgery, the part of the stomach where intrinsic factor is secreted is avoided and never exposed to food. Therefore, deficiency of vitamin B12 after bariatric surgery occurs from either inadequate intake, reduced absorption or a combination of both. When does deficiency of vitamin B12 manifest? The liver is responsible for the storage of most nutrients in the body, releasing them in the right quantity when the intake is low. In the case of vitamin B12, the liver stores it to a significant amount that can serve the body for an extended period (up to 3years). Thus, deficiency symptoms may not occur early after bariatric surgery. Nevertheless, studies have shown that a significant number of patients become symptomatic within 1-2 years of gastric bypass surgery if not on the supplement. Having known that the primary cause of vitamin B12 deficiency is poor absorption from reduced or lack of intrinsic factor, it is important to go for supplements that are majorly absorbed from by the mucosal lining of the mouth. These are referred to as sublingual vitamin B12 lozenges. Other forms of B12 supplements are; injectable and nasal spray. The lozenges should be placed in your mouth and left till it dissolves. This will ensure absorption from the mouth. The dosage is 500mcg per day. The injectable form is taken once in a month at a dose of 1000mcg. A weekly dose of nasal spray is another option. In conclusion, vitamin B12 supplement is important after bariatric surgery especially for patients who have had gastric bypass surgery. Sublingual lozenges are better and preferable as they are absorbed directly from the mouth. However, other forms are also available, and you should always discuss your choice with your dietician or physician.